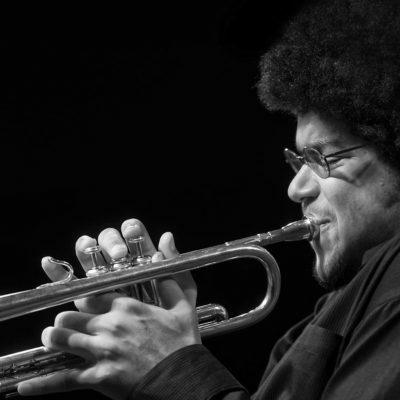 JOSH EVANS, born and raised in Hartford, CT, was drawn to the trumpet after hearing a Roy Eldridge and Dizzy Gillespie recording at the age of 10. Josh began studying with Raymond ‘Dr. Rackle’ Williams and within a year he began performing regularly with Dr. Rackle’s Sound Griot Brass Band. By the age of 14 Evans’ musical career began to take shape when he started to study with and be mentored by the celebrated alto saxophonist/composer, and educator Jackie McLean. Studying under McLean who shared the bandstand with Miles Davis, Charlie Parker, and Art Blakey, would be pivotal in Josh's career. The experience would blaze the path for performances with Jackie McLean which included New York based venues known as the Blue Note, Iridium, the Regattabar located in Boston, MA, and the Bushnell Center for Performing Arts in Hartford, CT. In April 2005 Josh began a Three and a half year stint with the Winard Harper Sextet, touring the United States performing and conducting master classes. The group personnel, at different points, consisted of Billy Taylor, Frank Wess and George Cables, as well as trumpet players Terrell Stafford, Claudio Roditi and Phillip Harper. The group would also record a wonderful album in 2006, entitled ‘Make it Happen’ for Piadrum Records. In April 2007, Josh was invited to perform a two week tour of Siberia with master saxophonist, and composer Benny Golson. It was during this time period that Evans would also start performing with master Drummer Rashied Ali and would become the bands trumpet player for the next two years. The Rashied Ali Quintet toured 18 different countries and recorded one CD Live in Europe. Josh Evans would play with Rashied Ali until the drummer’s untimely death in 2009. In January 2011, Josh Evans recorded and released his debut album ‘Portrait’. This Album shares Evans influential relationships with Rasieid Ali, Jackie McLean, Raymond Williams, Alan Palmer, and Ralph Peterson.